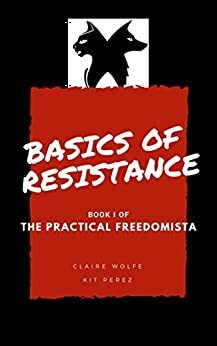 This post is simply promoting a friend’s work and encouraging those of you who “want to do something” to start with a reading of Kit Perez’s and Claire Wolfe’s new book, ‘Basics of Resistance’. I have not read the final version but, I was privy to the advanced copy… for purposes of review, critique, and vetting for accuracy. By my estimation, it is a solid primer of resistance theory and technique in a world gone nuts. Bear in mind that there is a distinction between “revolution” and “resistance”… although, many times that distinction gets a little fuzzy. Kit and Claire are both solid folks (although on slightly different ends of the socio-political spectrum) and have done a nice job in this volume. If you look at the world around you and think that something ought to be done, start with acquiring and reading this book and following the Patrick Henry Society blog. Your inner activist will be glad you did.